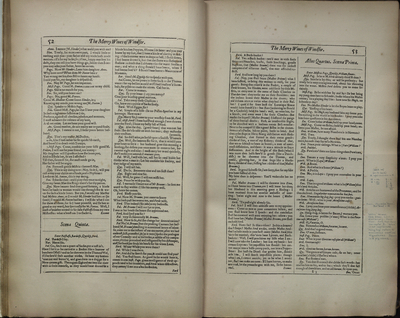 Two pages of 'The Merry Wives of Windsor' in the SUNY Buffalo State facsimile of William Shakespeare's First Folio from 1866. In April 1928, the last volume of the monumental Oxford English Dictionary (OED) was published. It contained over 400,000 words, with each given its own history of use to explain to dictionary users how the meaning of a word might change over time. It was the first dictionary to explore the evolving meanings of words directly and cost between 50-55 guineas when it was released in 1928 – the equivalent of over $4,000 in today’s currency. As shown on this page of the SUNY Buffalo State First Folio facsimile, the marginaliast reveals another clue about him- or herself: access to the OED. Noted in the margin of this page is, “‘latten’ means thin brass. Look in dictionary. Same then [emphasis added].” Since the OED was the only dictionary at the time to provide information related to the historic meaning of any given word, it is safe to assume that the marginaliast used the OED to determine that the definition of “latten” had not changed since the 1600s. The fact that the marginaliast used the OED could mean a few different things. Access to the OED could mean that the marginaliast was very wealthy and purchased his or her own copy after its publication in 1928. Or, use of the OED could mean that the marginaliast had access to an institutional collection that owned a copy, such as a local university or public library. Either way, the marginaliast was most likely writing after the OED’s publication in 1928. “History of the OED,” Oxford English Dictionary, accessed April 24, 2016, http://public.oed.com/history-of-the-oed/. “Dictionary Facts,” Oxford English Dictionary, accessed April 24, 2016, http://public.oed.com/history-of-the-oed/dictionary-facts/. Historical Currency Conversions, accessed April 24, 2016, https://futureboy.us/fsp/dollar.fsp?quantity=50¤cy=guineas&fromYear=1928.